I think eating is one of our most culturally social activities, and I think sharing a meal with friends is one of the best ways to shed off the stress of the work day and let your hair down (if you have some) for more fun fare. To that end, I've made it a personal mission to sample as many of the great eateries of Deep Ellum with as many friends as I can muster. Frank, Lu, Lauren, and me… the Teenage Mutant Ninja Turtles of dinner! Chance are, if you've lived in Dallas for any amount of time, you have heard of Cafe Brazil. If, by some miracle of chance, you have not heard of it, Cafe Brazil is a local chain of coffee shop diners with a diverse menu and a uniquely community-focused feel. Each location in DFW (and Denton) have their own character and ambiance, taken on from the residents, students, and businesses around them. It's the kind of place where you can go in, enjoy a nice warm cup of coffee and some comfort food, and just enjoy the art on the wall, watch people, or just read a book. I frequent Cafe Brazil enough that some of my friends are tired of it, and at least one friend has said, "you have an addiction". When I said the menu was diverse, I wasn't lying. You can get everything from Pancakes to Chilaquiles, from a BLT to the Vegan Tacos. Top all of that off with some fresh baked cake, and your dinner is set. If you're a coffee lover, like me, then you will also love the coffee bar, with about 9-10 different options that rotate regularly. And if you like a coffee you have there, they also sell the coffee beans by the pound! If the food wasn't awesome enough, there's also art covering the walls from local artists. All art there is available for purchase, which both helps to give the place a unique look and supports the local art community to boot. Cafe Brazil is always unassuming, inviting, and homey; a great place to catch up with friends, catch up on work, or just relax. 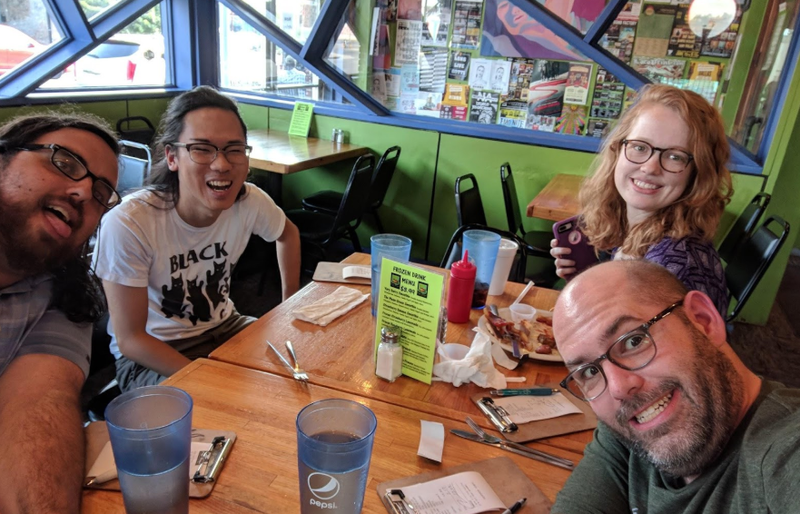 This week, I met up with Frank, Lu, and Lauren for dinner at Cafe Brazil. We talked about our favorite characters, hilarious jokes that we heard that week, improv classes, and our jobs. Like everything I've come to know at DCH; the dinner tables are always a place where all are welcome, everyone is encouraged to just be themselves, and the love and support are shared around generously. Our dinner tables are full of funny stories, giggles, and full-face smiles. I entreat you to gather a group of your friends, and give Cafe Brazil a try yourself. Enjoy the coffee, try the Vegan Tacos, and pass around the love like there's a surplus that gonna go bad if you leave it sitting out! Josh Schneider is a level 4 improv student, coffee drinker, and once had a program compile on the first try wit no errors (Hello world indeed!). You can normally find him having dinner in Deep Ellum and at the Jam on Tuesdays, and in Heat Wave on Thursday nights this summer!